The week before Christmas is a busy time for most people. 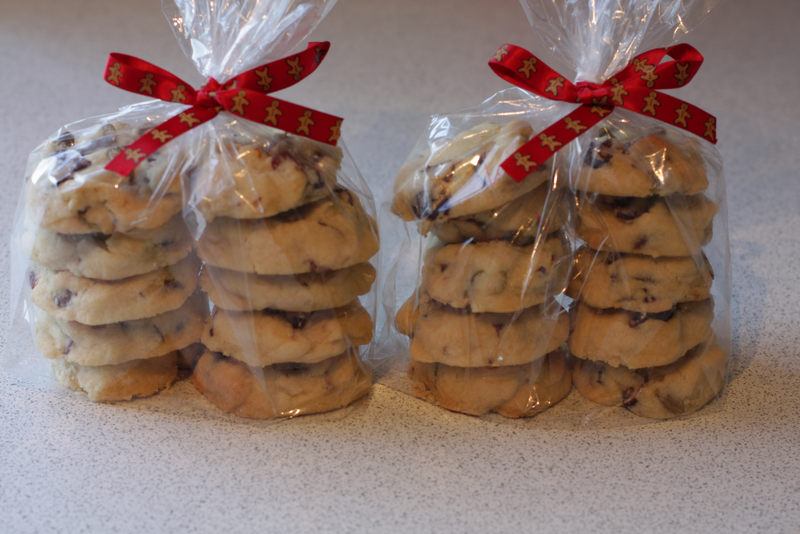 I was particularly busy in the kitchen baking lots of treats as gifts. 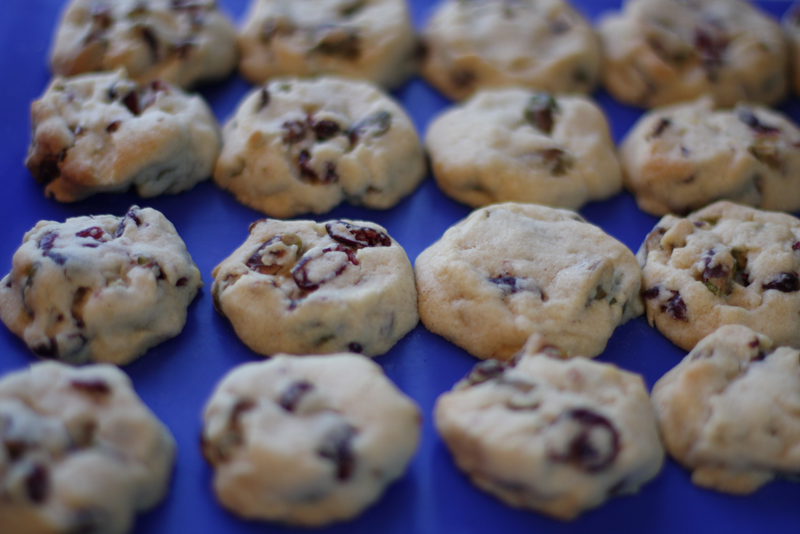 This "make ahead" recipe was brilliant as I prepared the dough a month in advance, meaning that it was very quick to finish the bake one morning. The recipe used was another from November 2011 BBC GoodFood Magazine available here. In a large mixing bowl I added 175g of Flora Buttery (rather than softened butter), 85g of golden caster sugar, and ½ tsp of vanilla extract. I creamed these together with an electric hand mixer. I'm sure it is possible to use a wooden spoon, but I'm lazy and this seemed easier. 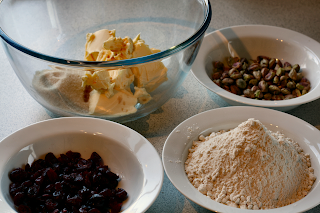 I added 225g plain flour and cautiously lowered the hand mixer straight down into the bowl on a low speed. No cloud of flour generated. The mixture came together. I added 75g pistachios. If like me you buy these in these in their shells, and do the hard work yourself, then you'll need to buy about 300g. Them shells are heavy packing. 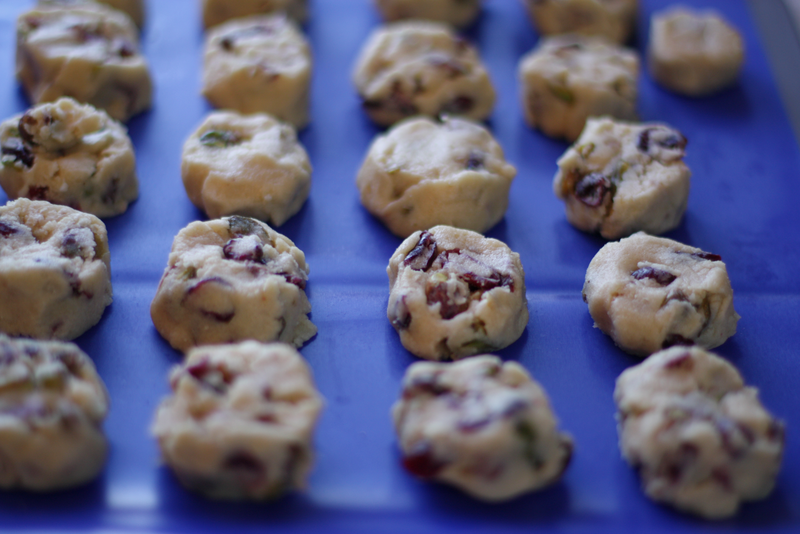 In went 75g dried cranberries. The hand mixer met my final ask of it to distribute the fruit and nuts evenly through the dough. I used the lowest speed and when the whisks got a little clogged, just lift them out a little so the mixture spins free. 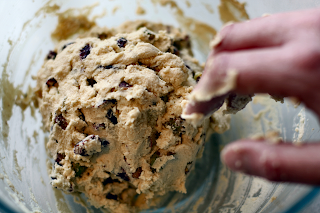 To bring the dough together it was time to get my hands dirty. There's a photo to prove it. I brought the dough to form a ball. 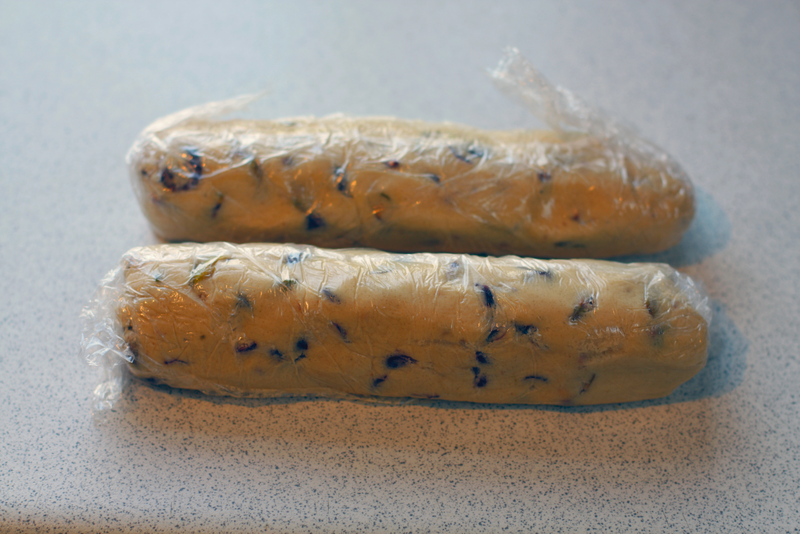 Using a plastic spatula I cut the dough ball into halves.I cut two lengths of clingfilm and on them shaped the dough into two 5cm thick logs. These need to go in the fridge to chill for an hour, but I kept them in the freezer for a month. (They keep for 3 months). Time for washing up. You probably don't want to here about this, so lets jump ahead 30 days. 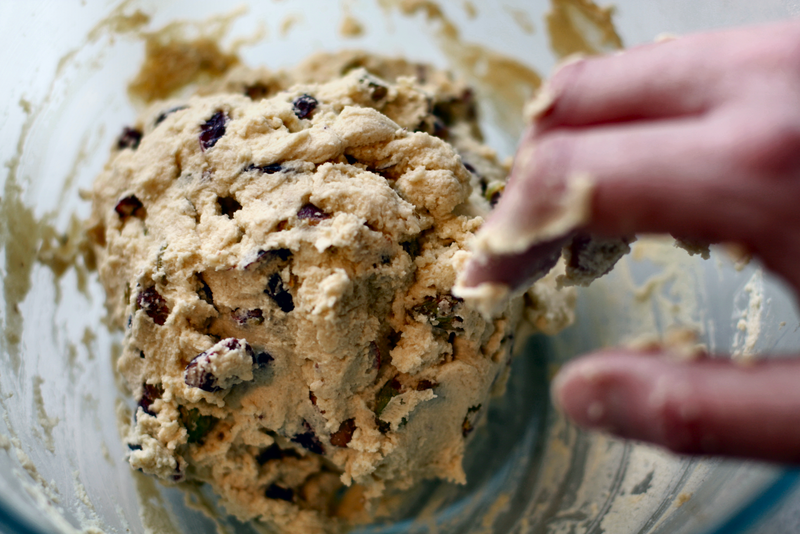 You need to take the dough out of the deep freeze some time before you come to use it. I moved it to the fridge the night before so it was fine. I set my fan oven to 180°C. 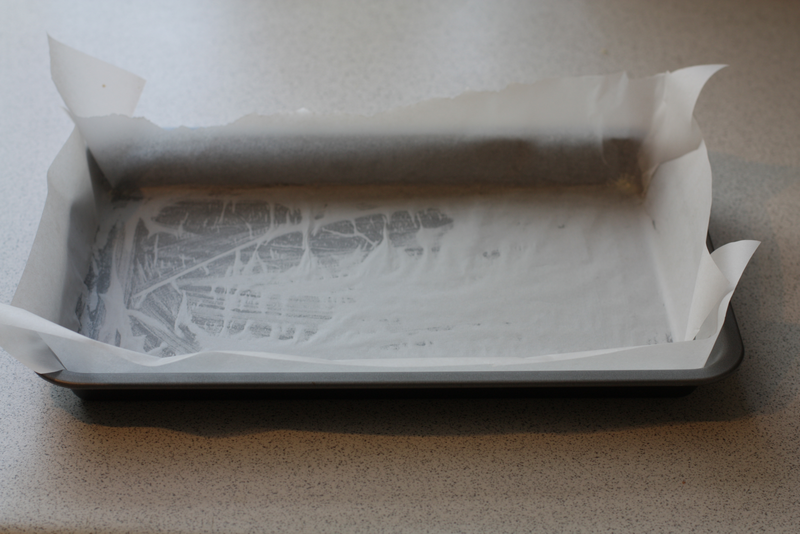 I lined my baking sheet with a silicon mat.I could have used parchment, but I've been impressed by these mats. I used a sharp knife to slice 1cm thick rounds. I inevitably encountered fruit or nuts as I made my cuts. This was no time for panic. Flick 'em out, complete the cut, then squish 'em back in. For sharper edges, I could have cut them when the dough was harder, however I was quite happy that the biscuits were not uniform. I wanted the chunky, rustic, home made feel and think I achieved this well. After 12-15 minutes in the oven the biscuits had spread a little on the tray. They had kissed but not joined. The colour didn't change much at all, but they were done. I left them to cool on the tray before bagging for gifts. The recipe says you'll get 22 biscuits. I had 20, plus a smaller taster for quality control. I like this recipe and can imagine it could be varied easily to get many flavour combinations. 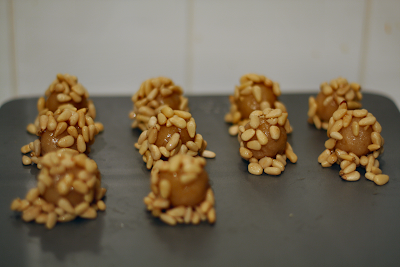 After my haphazard attempt at panellets, I was left with just short of a kilo of marzipan to put to use. Not being well, this had been left wrapped tightly in clingfilm in the bottom of the fridge for a month. In my childhood my family would make marzipan sweets, coloured and shaped to resemble fruits. Occasionally some marzipan was left over, and we'd coat it in chocolate. This chocolate covered marzipan stayed moist, whereas the fruits would dry out. 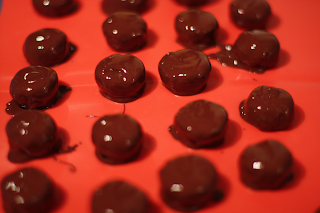 I decided I would make chocolate coated marzipans, three ways for my family Christmas. Unwrapping the first 300g block of marzipan, I was cautious as to whether it had gone off. Fortunately it did not smell at all bad, and had become quite dry and very hard to work. This lack of moisture was important to it staying fresh. 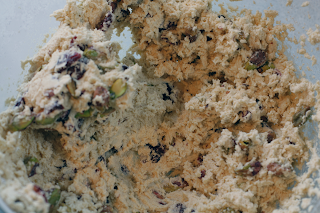 I continued to put the full force of my weight into kneeding the crumbling block of paste. 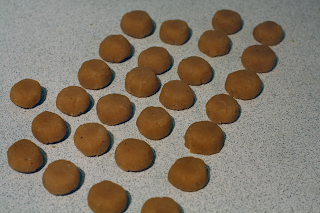 After a few minutes of working the almonds released their natural oils and I was able to roll some conker sized balls. As an afterthought I flattened these to prevent them rolling about. I prepared a tray with a silicone mat. You could use greaseproof paper, but I prefer these. In a medium glass bowl over a small pan of simmering water I melted 200g of Tesco Finest Swiss Plain Chocolate with Mint. When it was runny and glossy I simply rolled a sweet in the chocolate and lifted it to the tray using two teaspoons. Looking in my store cupboard I found Dr. Oetker Sugar Crunch, which I'd bought without a specific use in mind. 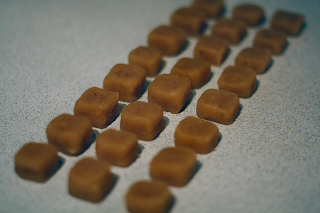 I knew this would easily identify my minty sweets and add a little crunch so liberally scattered over the tray. With this batch finished I transferred to the fridge to harden. To be honest with you. It was another day that I came to make the second batch. After working the second lump of marzipan a little to soften, I made a shallow well and poured in about a shot of Three Barrels VSOP French Brandy. 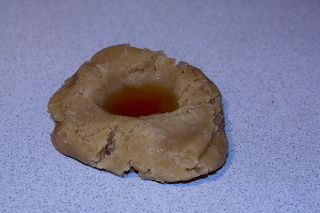 I then just folded it in on itself and worked it more until any spillage was soaked into the paste. This made it much easier to handle. For a different shape I rolled the ball into a sausage. Where the sausage broke, and it will, I just rolled each piece in turn until it was again the thickness of a conker. Next I pressed gently to square-off the sausage, and then with a sharp knife cut 1cm slices. It doesn't matter if they aren't identical. It lends to the handmade charm and everyone likes to find the oversized 'bonus' sweet. I used 200g of Cadbury Dairy Milk Chocolate. 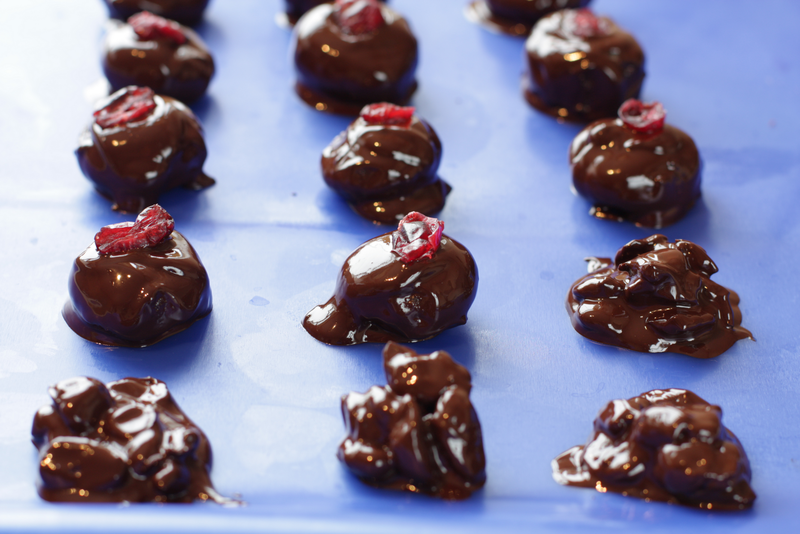 I could not get the same gloss that I achieved with the dark chocolate, and I also found it harder to work with. It seems milk chocolate is more prone to overheating than plain. I should have removed the bowl from the simmering pan once the chocolate had melted. Another lesson learned. 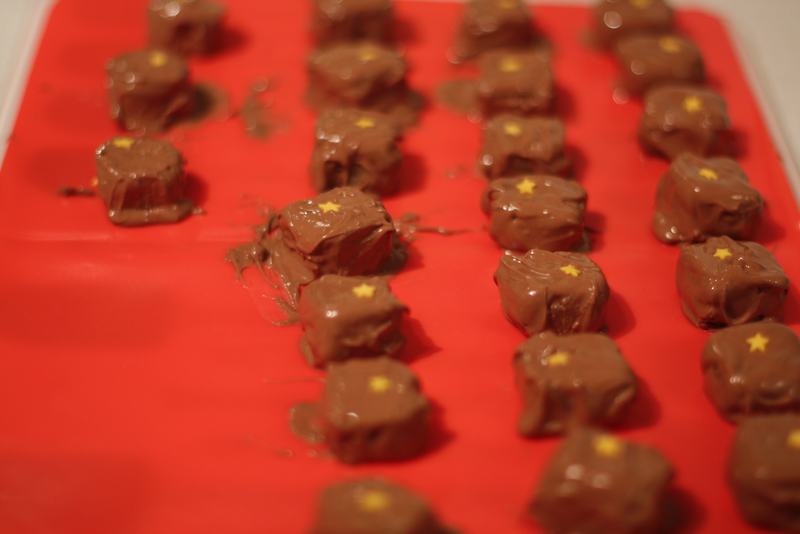 To decorate my brandy sweets I placed a single yellow sugar star on each. These I'd got from Asda as a 'sprinkles' selection. For the third and final batch I allowed my marzipan to absorb 2-3 shots of Disaronno Originale. I formed these sweets into rounds and coated them in Tesco Finest Swiss Plain Chocolate. I topped these with a dried cranberry 'hat'. Festive. No chocolate was wasted. Any left over from the marzipan was used to coat walnut pieces and raisins; anything for a little surprise. I can tell you that all of the sweets were enjoyed over the holidays. The marzipan enriched by the fruity Disaronno was by far the best sweet. It went so well with the cranberry and the bitter dark chocolate. I like it when things go well, and I like to be proud of what I do. It's not really in my nature to present my failings when the results don't meet my standards. However, we can learn from mistakes, and move on and grow. A Spanish colleague of mine returned from a trip home to Barcelona and brought with him a box of Panellets. These are a Catalonian "Almond Cake" that are traditionally eaten during their festival Castanyada, celebrated on All Saints' Day, which is 1 November. 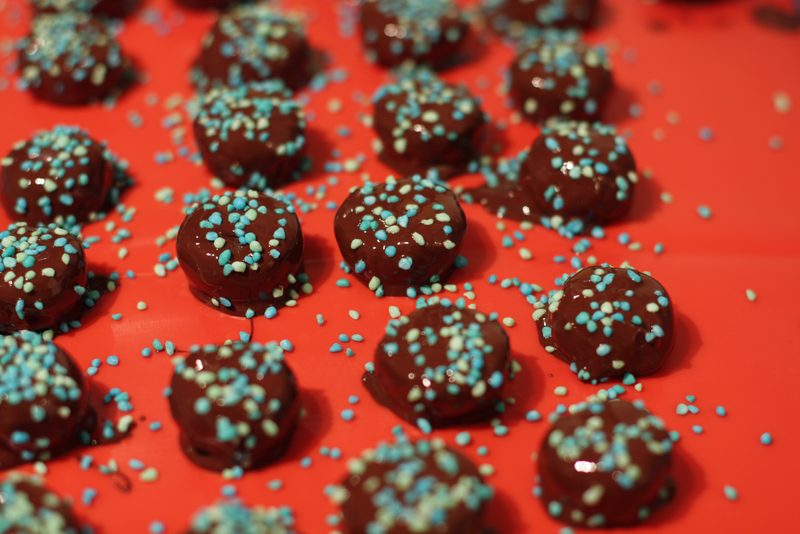 I really enjoyed these sweets that were completely new to me and decided to try and make them. My colleague's English is good but not yet fluent. 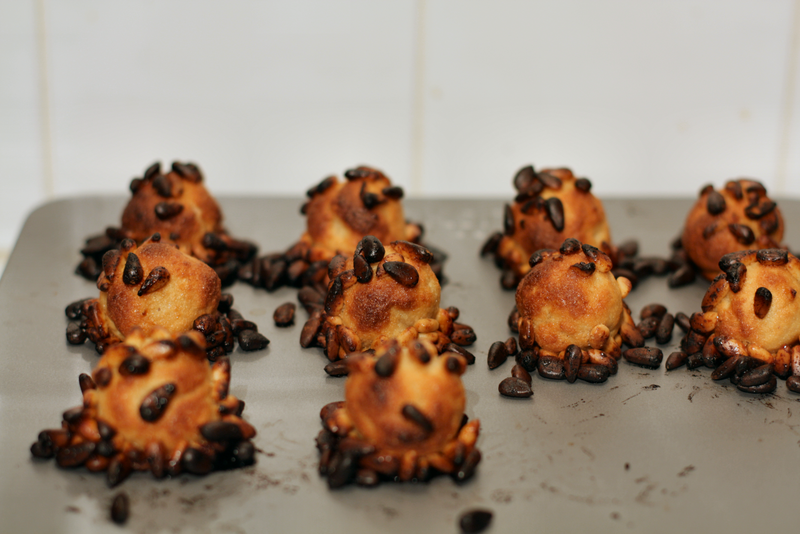 Using a few searches on Google Images I finally found the name 'Panellets' and then went hunting for recipes. I settled on this recipe I found, that also introduced me to this great site theydrawandcook.com. If you are looking for a gift for a foodie friend, check out the shop for the book or maybe a print. Unfortunately for me picking this recipe for Panellets was where it all went wrong. So I'd mixed 500g of caster sugar with 500g of ground almonds and two eggs. I split the combined "paste" into three equal parts, wrapped it in clingfilm and chilled it in the fridge overnight. 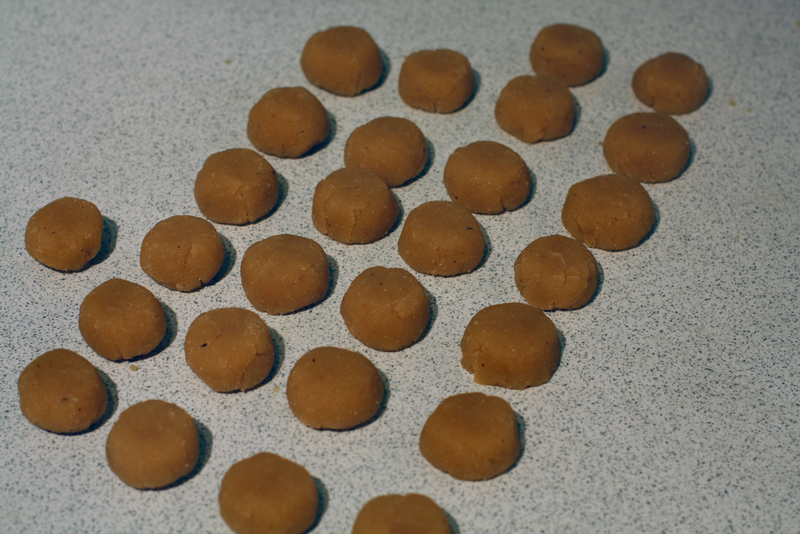 Briefly discussing my efforts on Twitter, it was pointed out that I'd inadvertently made a kilo of marzipan! This didn't sound quite right. On the next day I decided to deviate slightly from the recipe and make the classic presentation - balls rolled in pine nuts. Improvising, I decided to try to use runny honey as a glue. It worked to a degree, but certainly looked nothing like it should. I was making such a mess I stopped after 10 sweets and put the rest of the marzipan back in the fridge. My fan oven never achieved the 240°C asked for by the recipe. When it was near enough I put in the sweets for 7 minutes. 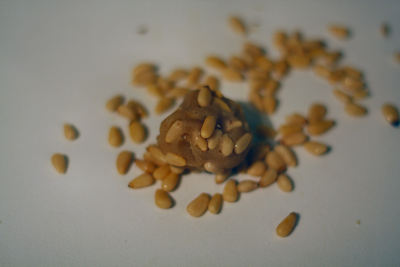 You can see here that the honey and indeed the nuts and marzipan all burned. Returning to work on Monday, my colleague asked how I had got on. He couldn't help but chuckle. On Tuesday he brought in his Catalan recipe book. Imagine my surprise on learning that an essential ingredient to Panellets is potato. I needed to boil, mash and cool 150g of potatoes and add that to the mix before refrigeration. 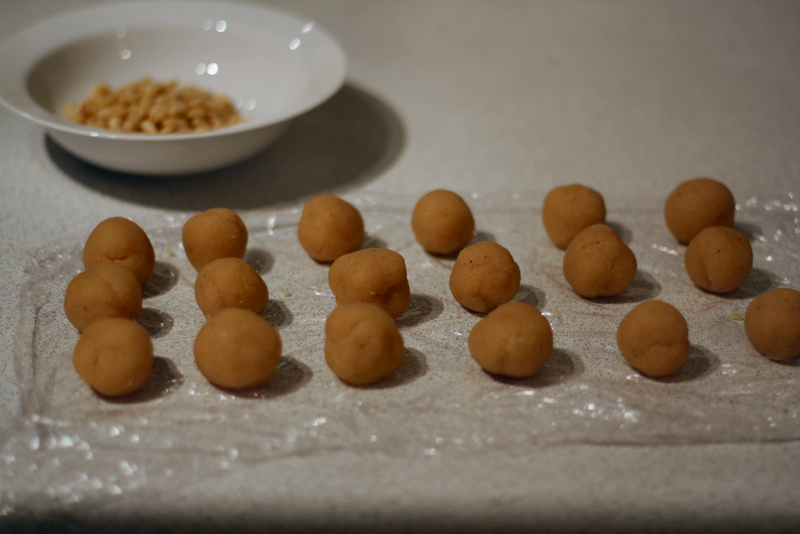 To successfully coat the balls, I should have rolled them first in cornflour, then egg white, then pine nuts. Finally brush with egg yolk. 220°C for 10-12 minutes seems more reasonable. I've learned that the best illustrated recipes are not the most complete. If you are going to experiment, the results won't always be good, but that's OK. Tightly wrapped, 800g of marzipan keeps in a fridge for month. If you've not yet done so, click here to see some pretty examples of these on Google Images. I won't be attempting these again any time soon, but as an alternative to straight marzipan I'll encourage you to have a go. Happy New Year to you. I trust you had a lovely break from routine to enjoy the festivities? I certainly appreciated time with family, great feasts with roast beasts, and a some quality Christmas television. Without wishing to sound negative though, I've been bothered by headaches and colds through most of November and December. This kept me out of the kitchen, and at times, off work. I had decided to make a few treats for Christmas presents and I really liked the look of this recipe from November 2011 BBC GoodFood magazine available here. I lined my 20 x 30 cm baking tin one evening ready to start the following day... and then didn't revisit it for a month as I fought off a virus. How annoying. Some weeks later, I was able to get back to business. 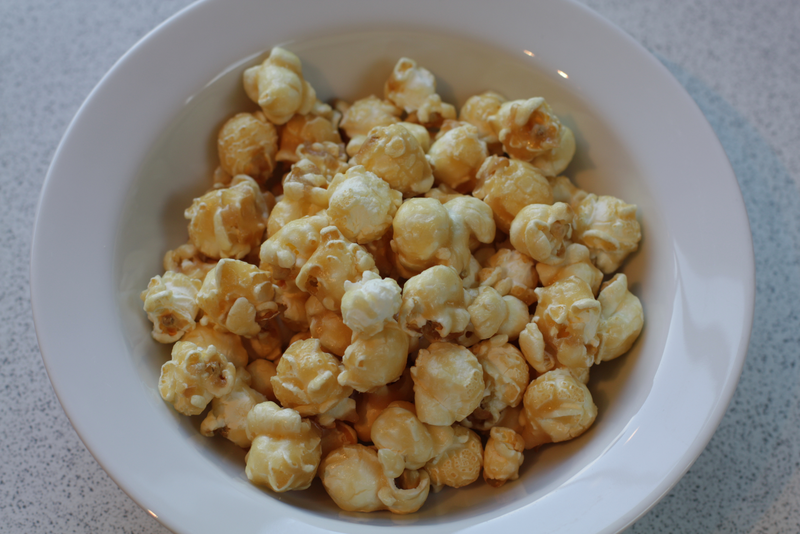 The recipe calls for two 30g bags of popcorn, but I chose to buy a larger bag of Butterkist toffee popcorn and use 60g. It's more economical and I wanted to use only whole corns, no crumbs. This also left me with a sizable portion of popcorn to accompany a Christmas movie. (Home Alone is my favourite). 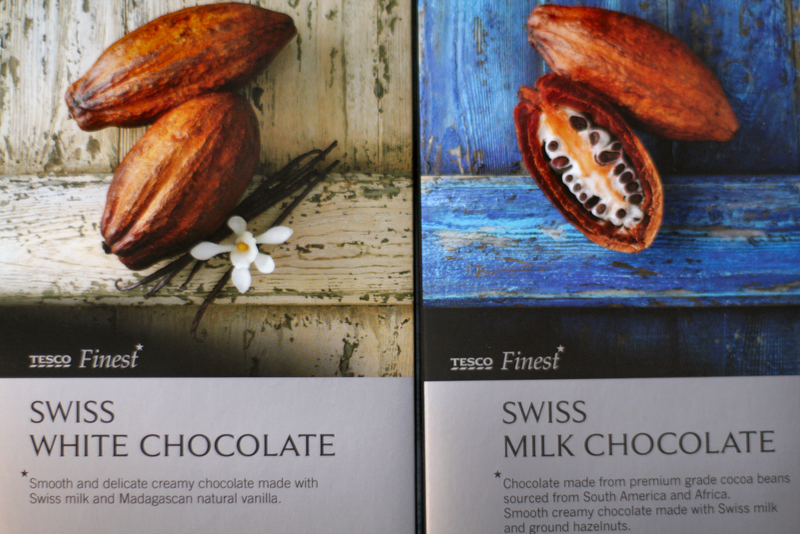 I chose to use 200g each of Tesco Finest Swiss white chocolate and milk chocolate. I decided to melt the chocolate over a pan of simmering water. The trick here is to use a small (milk) pan and 2 medium or large bowls. The important thing is not to let the bowl touch the water. Keep stirring as it melts, so that the runny chocolate doesn't cook whilst you are waiting for the lumps to melt. 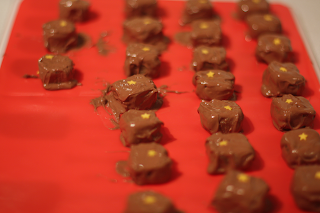 I cautiously poured half of the white chocolate into the tray, followed by half of the milk chocolate. 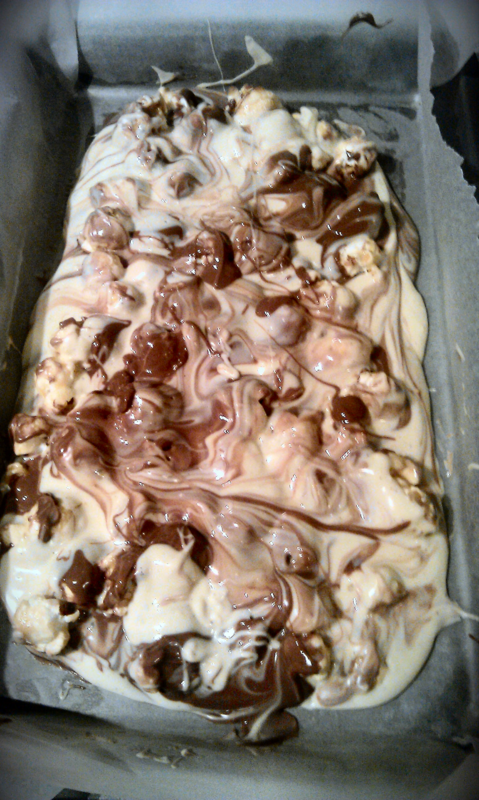 I used a spatula to swirl the two together and spread it out a little. After scattering on the popcorn I poured on the remaining chocolate and gave it another brief swirl. You can see that I didn't push the combination to the very edges. I was a little worried about not covering the popcorn fully, causing it to go soft. Once it was set, I chilled it in the fridge for a couple of hours, then roughly broke the bar into 8 pieces, putting two pieces per bag. I can say that it in a tightly tied bag, it kept well for at least a week and was quite delicious when I sampled it on Christmas Day. This simple recipe was a great success. One relative who prefers dark chocolate, and avoids white chocolate, found the combination quite agreeable, and couldn't get enough of it.